Telecom Giant Bharat Sanchar Nigam Limited (BSNL) has introduced new two National Roaming Special Tariff Vouchers under GSM Prepaid Mobile Services across Punjab Telecom Circle. 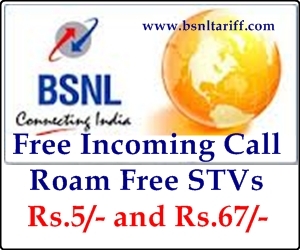 The Competent Authority of BSNL Punjab Telecom Circle introduced two new National Roaming Special Tariff Vouchers (STVs) of Rs.5/- and Rs.67/- which offers Out going call second tariff and incoming call FREE while on roaming. The National Roaming Special Tariff Voucher of Rs.5/- offers, 1.5 per second Out-going call for Local/STD, Free Incoming call with validity for 1 day. The National Roaming Special Tariff Voucher of Rs.67/- offers, 1.5 per second Out-going call for Local/STD, Free Incoming call with validity for 30 days. All other charges will remain the same as per the base paln available in Punjab Telecom Circle.